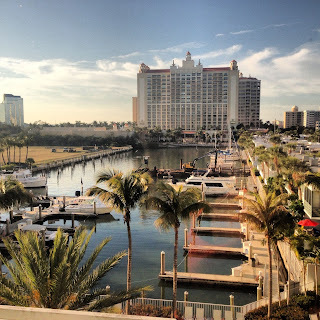 This weekend, we stayed at the Hyatt Regency Sarasota while in town for the First Watch Sarasota Half Marathon. My friend Judi suggested we stay at the Hyatt which happened to be located in adjoining parking lots as the start and finish line of the Half! For anyone looking to sign up for the First Watch Sarasota Half Marathon in 2014, this is the hotel I suggest you to stay at for multiple reasons. Upon walking in the doors of the Hyatt, I instantly knew why Judi suggested this location. 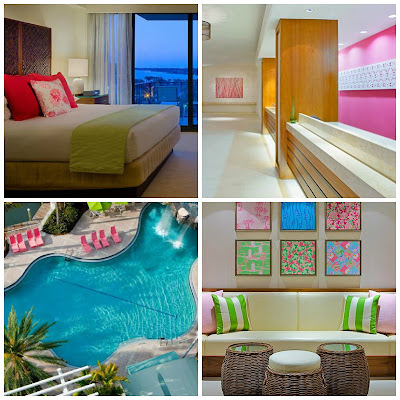 This hotel is very chic and modern while having a comfortable feel to it. I wondered many times if Lily Pulitzer personally decorated the hotel as pinks and greens welcomed you at every turn. This is my ultimate favorite color combo so I was in heaven. I normally wouldn't use stock photos of the hotel but Hyatt's represented so much better than the ones I captured. The weather was a little cool for us so I didn't get to spend time at their beautiful pool with three waterfalls. I will have to save that for my next trip to Hyatt Sarasota! 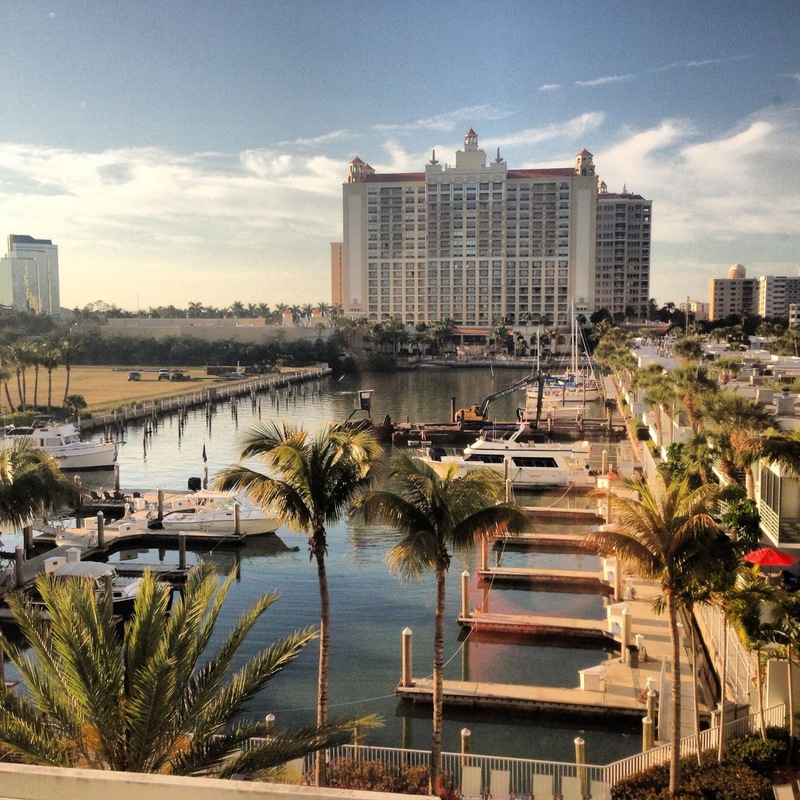 This photo was taken by me - and it is the view from our beautiful room, overlooking Hyatt Regency Sarasota's marina. I sat on the alcove in our hotel room drinking coffee while watching the activity below. Inside of Hyatt Regency Sarasota is a hidden gem called Currents, a restaurant that embraces the farm to fork movement. Executive Chef Leo Gianulis' and team really know how to impress. Upon reviewing the menu, I instantly knew that we had to order the Pork Belly. 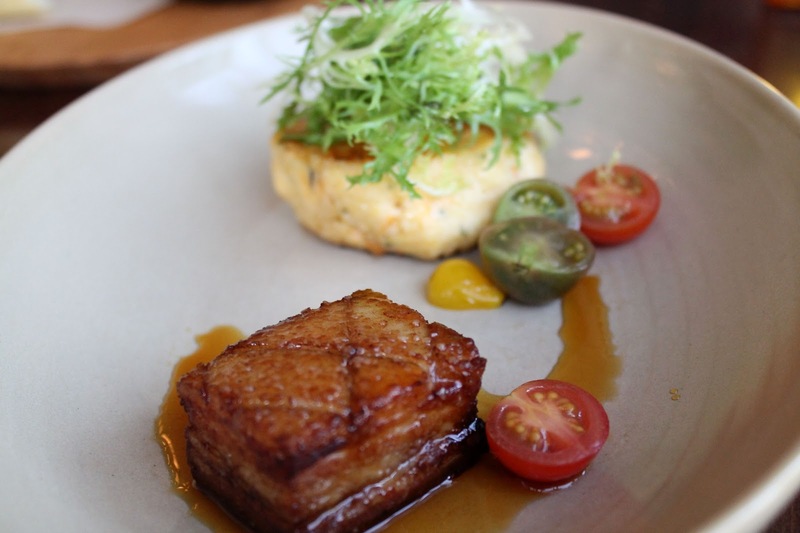 This Pork Belly came from Niman Ranch and was served with a smoked cheddar grit cake, apple reduction and frisée salad. I am a huge fan of pork belly and this was Gabe's first encounter with it. I believe I may have created a monster. Not to mention, the grit cake was pretty awesome. When it was time to place our order, I had a bit of a problem deciding what to order. While there was a particular fish on the menu that was calling out to me, my eyes kept going back to the pork chop - which is something I would never order at a restaurant. So I asked our server to surprise me and out came this masterpiece, a Niman Ranch Pork Chop that was hickory-smoked, served with amazing crispy brussel sprouts, natural bacon, maple-apple jam. I do not think there has been a time in my life that I went cross-eyed over a pork chop before until this very moment. It was beyond tender and juicy, absolute perfection. If you find yourself in Sarasota, PLEASE do yourself a favor....go to Currents, order the pork chop and enjoy this moment with me. 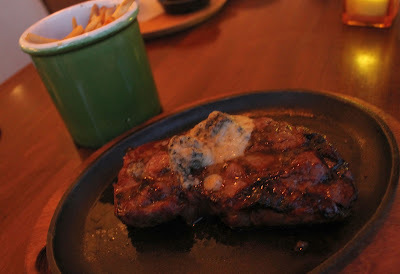 Gabe ordered the Niman Ranch NY Steak Frites. While he enjoyed his meal, he found himself having major food jealousy over my pork chop. "Spiced Resees Pieces" - peanut butter mousse, peanut butter powder, chocolate almond brittle, dried aleppo pepper and creme draishe. 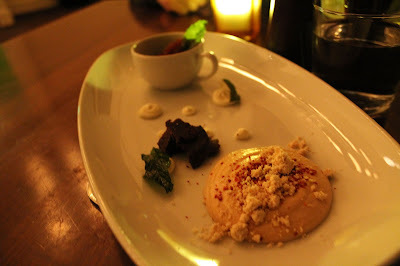 "Mint Infused" Chocolate pot de creme - Hazelnut tea "caviar", creme fraishe, fried mint leaves. Over the past month, we have truly indulged in amazing foods and desserts. This dessert was far superior to anything we had on our recent trip to New Orleans. 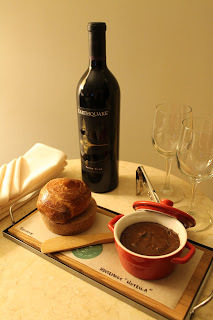 I loved the fact that the Chef''s at Currents think outside of the box while delivering. We need you guys in Tampa! When Gabe and I got back to our room, we found this treat - a bottle of Earthquake Petit Syrah and housemade nutella with a brioche roll. You really just hit melted heart on multiple levels! The hospitality of the Hyatt was amazing and we will absolutely stay here again when we come back to Sarasota. We learned quickly that this city is magical and there is no way possible to experience it all in one weekend. I found out that Chef Leo was also running the Sarasota half marathon and during the race, I actually saw him - he was up in the front of the pack which was awesome! Hyatt Sarasota is also very centrally located. You can easily head over to the historic side of Sarasota to go antiquing or grab a glass of wine while people watching. We found ourselves on Main Street more than once during our two day visit. The Hyatt is a few miles from the Ringling Bridge (trust me - I know the distance as I ran over it twice on this visit). 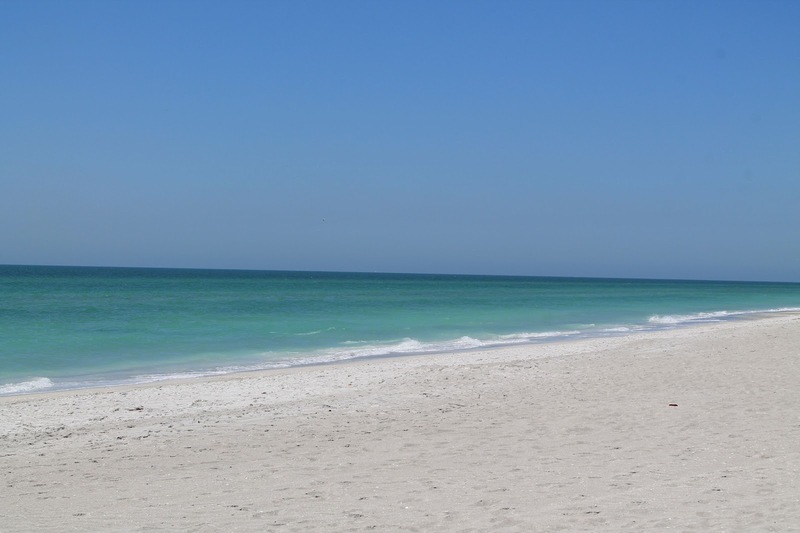 This puts you in great proximity to visit St. Armands Circle or head over to Longboat Key. My best friend vacations in Longboat every year and now I know why.....we will meet again soon Sarasota! Wow! This is really timely, we are planning a vacation in Sarasota over the summer hopefully! Thank you for making my decision where to stay a no brainer! The hotel is beautiful and so centrally located. You will really enjoy yourselves! 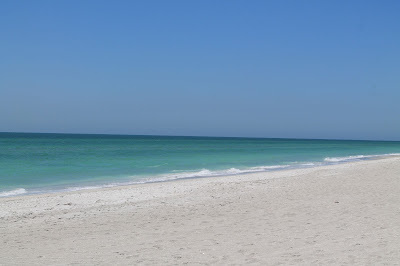 Wow, I will have to stop at Currents next time we head over to Longboat Key. Also, what a pretty hotel, I love those spring colors...so inviting!! You may want to plan your vacation around the third Friday of the month - Currents has a killer wine and cheese happy hour. Wow - what a great experience! I keep saying to Justin that we should take a staycation in Sarasota...just to get away for a day or two. That meal at Currents sounds absolutely amazing. Pork belly! YUM! Staycations are so much fun! You guys would really enjoy yourselves there. Oh what a nice experience! 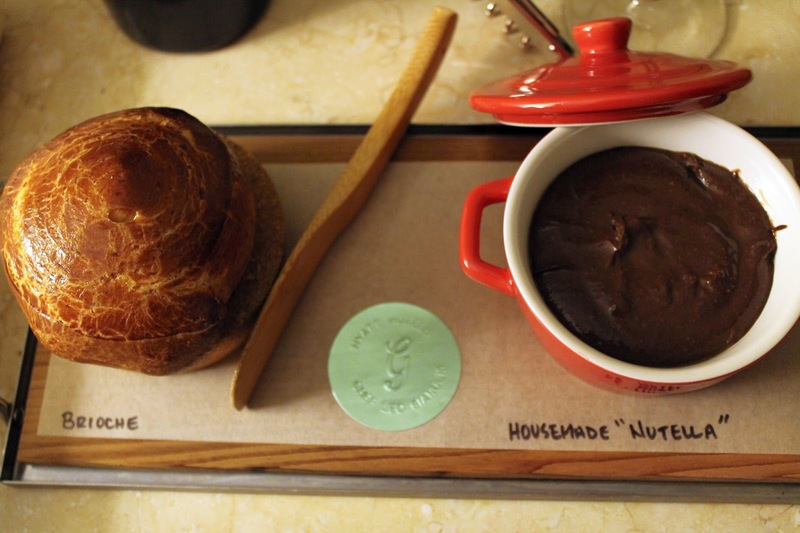 Heard great things about Currents, and the nutella/brioche was a very nice touch! Whoa. That photo you took from your balcony is impressive!!! That hotel is so nice too. As far as the food goes....I need that pork belly with cheddar grit cake. Oh and the pork chop with Brussels and apple jam? My oh my! Loved reading this post!!! !